Looks like a good system to work with. Do you guys need any help with typing up bios? Anything like that? This is merely a joke. We don't currently have bios for most of our units. Creators are allowed to submit their own bio (like Filthy did with Priscus, I believe). Otherwise, the C3V Fiction Team will work with the creator's vision of the unit to create a bio that meets everyone's expectations. As to needing help, I think we're fine at the moment. We have a good slate of judges and we are hard at work playtesting all of the units found in the OP. Expect to see a few more votes soon-ish. CVN~ "I highly recommend C3V customs!" Theme- Foe-Hammer is an awesome, thematic, sculpt-appropriate power. 4 attack dice fits the figure’s huge hammer well, and 3 defense fits the light armor he wears. And I’m perfectly fine with Einar summoning a Dwarf, especially a disciplined one like Grommel. However, I have issues with other areas of his theme. 6 move doesn’t make perfect sense for this figure, with all of the other Dwarf heroes having five move, and Grommel carrying around a huge hammer that has to slow him down a bit. 7 life doesn’t make sense either; the only humanoid with more than 6 is Valguard, and he has a huge lizard arm that increases his stamina. Tactical Repositioning also only activates when Unique Heroes use it, which doesn’t make much thematic sense (among other problems with this power; see the playability section for more). My biggest issue with Grommel thematically is what is not there rather than what is. He’s the first Dwarf hero without a defensive power, which is a trend that will eventually have to be broken, but is still disappointing to see happen. I know that Grommel has three powers already, but I think a defensive power is the first thing a Dwarf should have. None of these issues are enough to justify a failure on their own, but together, they do present a bit of a problem. Creativity- Foe-Hammer is my favorite part of the design in this category too. It doesn’t come up incredibly often, positively or negatively, but it demands your attention every turn you take with Grommel. An Einar dwarf is definitely a creative risk, but I think it works well for Grommel and expands the dwarf faction in more directions. Balance- Grommel has solid stats, especially for a bonding hero. 7 lives is great, but 3 defense alone means he loses those lives much quicker than any other dwarf. 4 attack is essentially the same as every other dwarf hero’s. 6 move makes him the speediest dwarf, and helps him quite often. But that alone is not enough to justify his 140 point cost. Can his special powers do it? Foe-Hammer is essentially a wash; you sometimes have to keep him out of any auras you may be using in order to avoid hitting your own figures, but it can also hit a huge blow into an army, if you get the roll at the right time. (I will note that the roll felt a bit high, but not enough to worry about) Climb x2 is just a handy ability. But Tactical Repositioning has tremendous potential to add mobility to the Dwarves, so I think in terms of cost he is close. Playability- Tactical Repositioning looks incredibly useful and strategic. Maybe even a bit too useful, and with an annoyance level on the caliber of Scatter. But once you factor in the Unique Hero restriction, it starts to look a lot less so. It never came up in any of my blind tournament armies tests. That’s kind of awe-inspiring, to be honest. A power that is basically Grommel’s signature turns out to be rarely used. But that’s not my biggest issue with the ability. I’m concerned with the fact that it is unpreventable and automatic. Powers like Scatter and Jandar’s Dispatch (the closest comparisons to Tactical Repositioning) can be avoided, or are unable to be counted on every turn. Tactical Repositioning is a guarantee, since once Grommel is within 6 spaces of a hero with an Order Marker on it, there’s no moving the hero out of the way to deny Grommel the power, since the next time you reveal a OM he automatically repositions his dwarves. It creates a frustrating experience for Grommel’s opponent, as they have literally no way to stop the power. Even that is not my biggest concern. The main reason that I dislike this power is also the single biggest reason I am voting Grommel down. Grommel hurts figures that do not need to be hurt. Solo heroes have it tough already, but a power that lets Dwarves swarm them faster, or move out of threat range in the case of a melee hero? It’s a huge punishment to figures that aren’t exactly competitive in the first place. Now, I know that there are a few heroes that do see some tournament play without bonding. Major Q9, Niflheim, and Fen Hydra all immediately come to mind. But guess what? Those guys are large or huge, so the Dwarves have an advantage against them already. What about Raelin? She typically only gets one order marker a game, and it’s usually in the first round before Grommel can get within 6 clear sight spaces of her to activate it. And those are the top tier heroes! What about the Sieges, Kumikos, Siivs, and other melee non-bonding heroes that are hurt even more by Tactical Repositioning? I don’t want to see hero armies get crushed even harder. Summary- Overall, my concerns are all created from Tactical Repositioning. It rarely comes up in normal games, and he’s a bit boring and underwhelming without it. And when it does come up, it comes up all the time, to the point of annoyance for both players, and makes Axegrinders ruthlessly crush an army they would have crushed anyways. And since it is so useful in these specific matchups, it prevents Grommel from excelling in practical situations, and also prevents Grommel from having that signature dwarven defensive power. I vote NO to induct Grommel Bronzewielder into the SoV. Rorshack brings another hero to the warforged faction to go alongside Siege and Heirloom. He falls in the D&D class of barbarian, and translates the iconic power Rage into a neat ‘Scape mechanic. Rorshack has fairly basic stats: 5/5/1/4/3, but comes with a hefty price tag at 150 points. most of his points come from his three powers: Rage, Roar of Triumph, and Warforged Resolve. The auto-shield from Warforged Resolve helps mitigate the downsides of using Rage, which drops his defense to 1 for the remainder of the round. So his stats can either be essentially 5/5/1/4/6 or 5/7/1/6/4, depending on whether Rage has been activated. This puts him at a decent price level, between Drake’s 6/6/1/6/4 at 170 and Eltahale’s 6/6/1/5/4 at 140. Coupled with the bonus from Roar of Triumph and the ability to boost his survivability, he is reasonably balanced. The idea of a warforged Barbarian is perfect for ‘Scape. And Rorshack’s translation of the Rage mechanic is pretty good: at the defense of his defense (get it?) he gets an adrenaline rush of extra speed and power. And Warforged Resolve works really well with this design, representing his natural resilience to weak attacks, even while not paying attention to his defenses. And you can just picture Rorshack bellowing loudly as he conquers an opponent, waiting for the next victim. The “X” Order Marker power works nicely thematically alongside Siege’s similar but opposite power. One issue I have with Rorshack is his name. The other warforged are named after objects, or occupations. This is consistent with D&D naming conventions as well as the HeroScape precedent. So even though a few warforged take names like most other humans/elves/dwarves/what have you, it seems a bit off. Not a deal-breaker, but worth mentioning. A second, but lesser concern is that Rorshack’s Rage power doesn’t do a whole lot. His attack is already high enough that a boost of 2 dice on a single attack is not that big of a deal. A bad roll on attack can really leave Rorshack in a bad spot if Rage is active. Even less of an issue than the name, but again, worth a mention. Working with a rather limited template (warforged barbarian) Rorshack fills both aspects well and with easy mechanics. It’s not hard to keep track of his powers, especially because Roar of Triumph occurs in only a small percentage of games. Rorshack is a quite creative design given the limitations placed on the design. Rorshack works quite nicely most of the time, especially when paired with everyone’s favorite figure, Raelin. With 3 defense at all times, coupled with an auto-shield, he’s pretty hard to take down. Even without a defense boost, he can ignore many squad/weak hero attacks despite only rolling 1 die. Against all-unique armies, or unique-heavy armies, Rorshack has a field day, especially against unique squad figures. He only needs to take out 1 squad figure to get the Roar of Triumph bonus. Unfortunately, this also makes him eat order markers in anticipation. A bad roll on turn 1 that doesn’t go Rorshack’s way can hurt Rorshack, as killing a unique figure on turns 2 or 3 doesn’t do that much. At one time when Rorshack was facing an all-unique army, he was destroyed by a squad of Tarn Viking Warriors after getting bad rolls early in each round. With normal/expected rolls, however, Rorshack performs better. 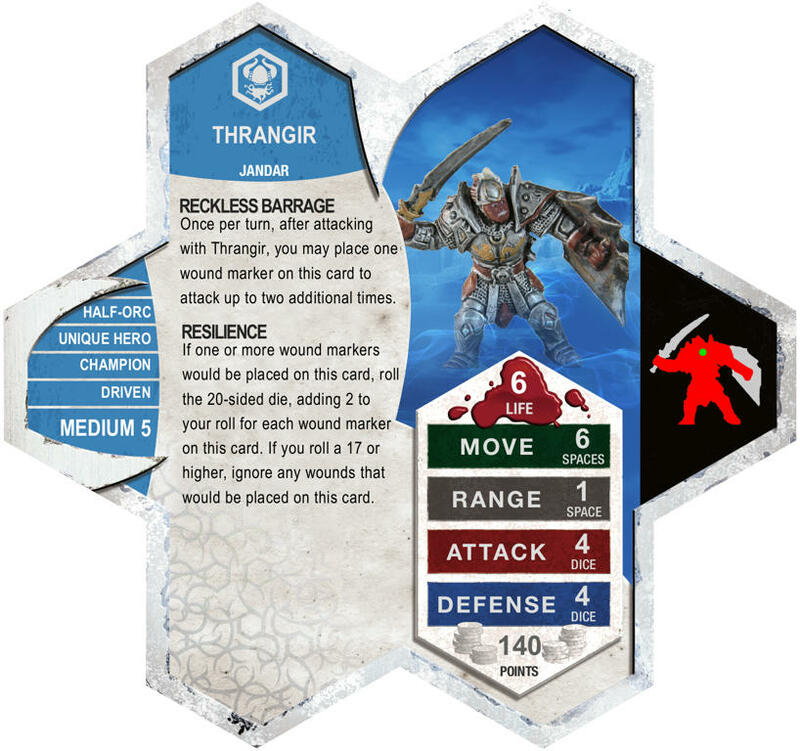 Rage provides interesting tactical decisions, wondering whether to reveal the “X” immediately, or for the second turn, or waiting until one final turn to mitigate the defense penalty. In most situations, I used Rage, but I tend to play a little bit riskier than others. Activating Rage certainly places an emphasis on attack, just leaving you to hope that Rorshack’s Resolve and Life will keep him from dying. On the rare occasion that Roar of Triumph comes into effect, it is devastating. Unfortunately, however, I rarely activated it. Most games he had no chance to use Roar of Triumph, even running against mostly hero-heavy armies, where the odds of killing a unique figure are high compared to horde armies. Against multi-hero armies, like Gruts, Dwarves, or multi-Hydra armies, Roar of Triumph just did not come into play, and would not generally have made a large difference if it had (1 attack against 2 less shields=2/3 of a wound). I appreciated the idea of Roar of Triumph, but it wasn’t worth the room it took up on the card for the very few times I was able to use it. There certainly are powers in official ‘Scape that are rarely effective, like Mindshackle or Rod of Negation, and there is a place for those abilities. Roar of Triumph, however, is not just unlikely to get to work, it has no chance at doing anything in most games. There are also powers, like Entangling Web, that are hard to set up. This is different to me, though, because it is so dependent on other events and the right Order Markers going to the right cards in both armies and getting the right rolls, etc. that it isn’t a matter of having to have the right positioning, it takes a lot of luck, not skill. I really enjoyed the concept of Rorshack, and had fun with his thematic mechanincs. However, I really wished Roar of Triumph either had easier conditions or was left off the card entirely. Some aspects of the gameplay of Rage also left me feeling a bit short-changed. Overall, this is a good design, but in need of a little more polish for me. Last edited by superfrog; May 18th, 2013 at 09:16 PM. These look interesting, are these reports on the miniature concepts themselves? Our mission is to review custom units for balance, playability and creativity and to approve deserving candidates for inclusion in HeroScape play. Approved figures will fit in the HeroScape canon thematically and will be suitably priced. I'm Krug in the Paradox Keep and Augamo on the Sacred Tundra. Correct flameslayer93, thanks anyway greygnarl. Playability-Are the powers clear and understandable? Are its master stats appropriate? If it is Large or Huge, what type of base does it use? Is it visually distinct from pre-existing units? Creativity-Does it add something new to the game? Theme-Does it fit in the HS universe? Accessibility-Is the sculpt, or sculpts, available, at a reasonable price, and with limited modification? To help with this, it is encouraged that a link to the mini is included with the nomination (check out Lamaclown's list of mini sites for help with that). Per our new guidelines, we are no longer considering this at the time of review. After hours and hours of playtesting and evaluation, each judge makes a final post where he explains his thoughts on the overall concept and votes based on the above mentioned criteria. Is that what you want to know NS? Thrangir was originally priced at 130, but I bumped his price after running a few more tests. Thrangir is a half-orc from Toril who has sworn off his bestial roots and fights for the cause of good. As a solo hero, he has a nice balance between dependable and risky. As he gets more wounds, it becomes harder and harder to damage him, and as he gets weaker, he can more safely attack with 2 or 3 attacks. The figure is less available than when I originally posted the custom, but in addition to abprices there are 7 at miniature market and 8 at coolstuffinc. abprices also has a few more than the numbers indicate, I think 36 in total from clicking all those links. Other ebay sellers have a few available each, making a total of 55-60 figures on the market currently. The miniature is Half-Orc Paladin #6 from D&D Underdark, and there is also a D&D promo figure that is less available with the same sculpt and a slightly different paint job. This unit looks fun and balanced. However it isn't my decision. Good luck. Reckless Barrage and Resilence are supposed interact, correct? I assume so but I want to be sure. I am always going to be wary of availability on DnD sculpts, especially when they are already a bit low, as is the case with Thrangir. But I think it can work, especially for a solo hero. Last edited by vegietarian18; May 18th, 2013 at 11:25 PM.